Ragamuffin cats are known for their sweet disposition and for their soft fur. A Ragamuffin cat makes a wonderful family pet, so consider a Ragamuffin kitten when looking for a cat to adopt. The Ragamuffin first appeared in 1994, so it is a relatively new cat breed. Incidentally, the Ragamuffin breed is closely related to the Ragdoll breed. Ann Baker, a professional cat breeder, developed the Ragdoll cat during the 1960s. She trademarked the name Ragdoll and established her own registry, the International Ragdoll Cat Association (IRCA). It is believed that the ancestors of the first Ragdolls (and Ragamuffins) were non-pedigreed cats; a fact that later played a role in the naming of the Ragamuffin breed. During the 1970s a group of breeders left the IRCA with the goal of obtaining a wider recognition for the Ragdoll. This group developed the Ragdoll standard which is currently accepted by the main cat registries. Because of increasing breeding restrictions within IRCA, another group left the organization in the early 1990s. They formed their own group, and developed their own breed based on the Ragdoll. This group would later ask the ACFA (American Cat Fanciers Association) for the recognition of their newly developed breed. The ACFA accepted the breed in 1994. The breed was named "Ragamuffin". The CFA (Cat Fanciers' Association) recognized the breed in 2003. So where did this name come from? The person who wrote the Ragamuffin breed standard saw the name fitting, arguing that the original cats used in the breeding of Ragdolls were street cats. Thus, these felines were true Ragamuffins. Ragamuffins are quite large. Indeed, male cats of this breed weigh between 15 to 20 lbs. on average while females weigh between 10 to 15 lbs. That’s a hefty bundle of fur! They indeed have strong, muscular bodies. Ragamuffins also have ample chests and big shoulders. Their head is a modified wedge, even though the forehead is round in appearance. They have a short neck. The coat of the Ragamuffin is about medium length, but it tends to grow longer around their midriff. Ragamuffins’ fur is soft-to-the-touch, even silky. But despite its length, it is easy to care for. The Ragamuffin comes in all colors and patterns. However, Colopoint cats are not allowed under the standards established by the CFA. Interestingly, solid-white Ragamuffins are highly sought after, but are somewhat rare. Another interesting fact about Ragamuffins is that cats of this breed reach adulthood very late (around the age of four). Isn’t that something? You’ll have a Ragamuffin kitten for some time. The Ragamuffin cat breed is well-known for its sweet, gentle nature. Indeed, Ragamuffins have a very docile temperament and love the company of people. These felines are quite loving and affectionate, too. Like dogs, they will follow you around. They will also love cuddling on your lap. 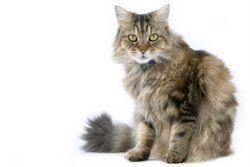 These qualities make The Ragamuffin a fantastic choice for a family pet. So if you are looking for a new pet for your family, consider Ragamuffin kittens! Beware of the fact that Ragamuffin kittens and cats do require lots of attention. They particularly don't like spending too much time alone. Take these traits into consideration before adopting one. Are your or do you know a Ragamuffin lover? If so, an item showcasing Ragamuffin cats will surely be welcome. You can find posters, calendars, and t-shirts featuring the Ragamuffin cat breed. And don't forget that you can also create your gifts. If you or your friends have a Ragamuffin, you can a picture of your cat (or your friend's cat) and personalize your gifts. Among other things, you can personalize mugs, t-shirts, calendars, and keychains.